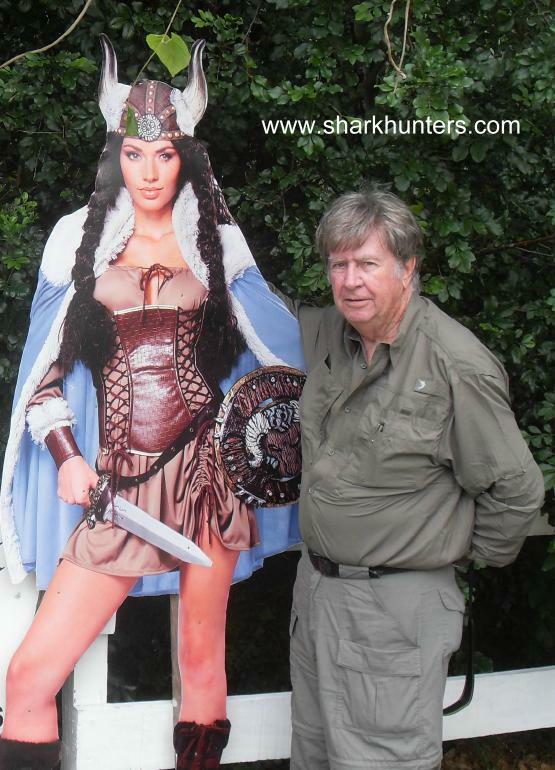 Previous, Fantastic Sharkhunters History Tours! Take a moment to ‘walk‘ through these “Tunnels of Time” in history. We actually LIVED this history, and we hope that you will enjoy what you see here in our past tours and will join us in the future. Our travelers come back again and again. Join us – you won’t regret it and you will have memories that will last a lifetime. Click on this beautiful photo and live this experience. You may see someone you know; you may even see yourself – but you will definitely see fantastic history. Go Places That Only SHARKHUNTERS Can Take You! Click on this beautiful photo of the ‘Eagle’s Nest’ and live this experience. You may see someone you know; you may even see yourself – but you will definitely see fantastic history. In June 2018, Sharkhunters President returned to the ‘Land of the Gaucho’ to check additional leads in the mystery of the escape of Adolf Hitler, Eva Braun and thousands of others of the 3rd Reich. Click on this sad, dead manor house that, if only walls could talk, could tell so many stories…..come with us now into the tunnels of time. “The Smiling Shark” is what an ME 262 jet fighter looks like but no pilot wants to ever see this on his “six” as it means the end of his mission – maybe worse. 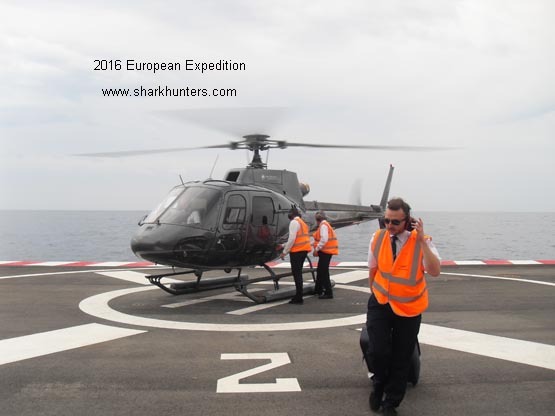 Click here to come along on another historic Sharkhunters “Patrol“. Fact-finding expedition – Mengele, Müller, two ladies…..
and others without whose financial help we would be no different than all those ‘wannabe‘ historians who never get off their fat – chair. History from Sharkhunters is REAL history, thanks to Members like these. Click on the photo to the right and join us on this expedition into the unknown history of the 3rd Reich in exile – or was that the 4th Reich beginning? Many thanks to these Members for their help to make this possible: JACK GOODIER, Member #127 the “Duck Hunter” and others without whose financial help we would be no different than all those ‘wannabe‘ historians who never get off their fat-chair. History from Sharkhunters is REAL history, thanks to Members like these. Click on this poor soul to the right and join us on this expedition. Once again we went places we have never visited before and again met with one or more S.E.I.G. Agents but nobody knew who they were. It is sad but laughable when someone tells us that they have been on our “Patrol” before so there is no reason to go again. Not true – we are always adding and fine-tuning our “Patrols” so they are never the same. It is even more foolish when someone tells us that they do not need a “Patrol” and that they can go the same places we go. Absolutely not possible! Who’s castle is this? HINT – it is not Tom Cruise. There was much more to learn in Europe and Cooper was up to the task. He was to meet with S.E.I.G. Agent FELDWEBEL SCHULTZ and his niece; with IGOR WITKOWSKI, Member #7412 and various personnel of Prince Albert of Monaco. 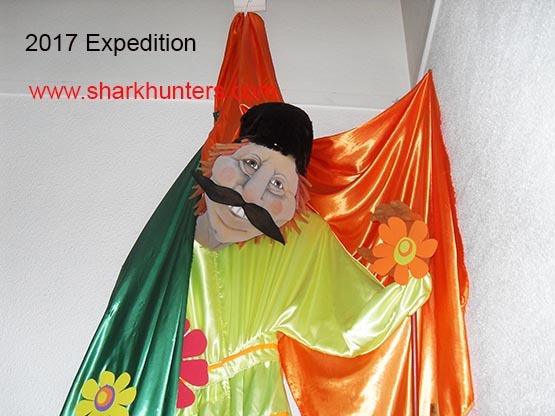 We have created an active link to the 2016 European expedition and it is ready now. CLICK ON THE PHOTO. All our photos were seen first on Friday 15 July on Rense Radio. We know what you are thinking – poor Cooper; he fell off his roof and spent three days in the hospital and four days after he got out, he was forced – that’s right, forced to go to South America (Argentina, Uruguay and Brazil) and endure all the hardships as you see here. Once there, he learned that Argentina and Uruguay are very similar in some ways and yet very different in others. The biggest difference was that almost anything German was illegal in 1939 in Uruguay and the British officials helped to plant the story that two Royal Navy battleships and the carrier HMS ARK ROYAL were waiting just outside the Rio de la Platte to attack and sink GRAF SPEE. This was a trick and played a large part in the decision of Langsdorf to scuttle his ship and eventually commit suicide. The similarities, aside from the same language more or less, was that speed limit signs, double yellow lines on the road and stop signs are merely suggestions, rarely heeded by drivers here. Click on this photo of Cooper and the Valkyrie and join us. This was an excellent Patrol as we saw more, learned more and had a great time with friends, old friends and new friends …and several S.E.I.G. Agents – but our Patrollers never knew which of them was the S.E.I.G. Agent… or Agents. 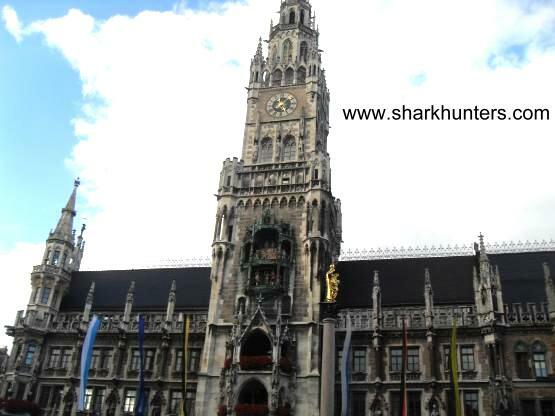 Click on the photo of the München Rathaus to the left and join us in photos. We hope you will join us in September of 2016 for this Memorial. We normally do not put comments on this page but this one from GREG LUTTON, Member #7848 is so well written, we have decided to make an exception. He came all the way from Australia to be with us on ‘Patrol’ and here is what he emailed…..
…..YOU should join us on Patrol. This was an abbreviated Patrol, but it accomplished a great deal as we met with friends, old friends and new friends……..and several S.E.I.G. Agents. Click on the photo of the secret location to the right and join us in photos. We hope you will join us in September of 2015 for this Memorial. 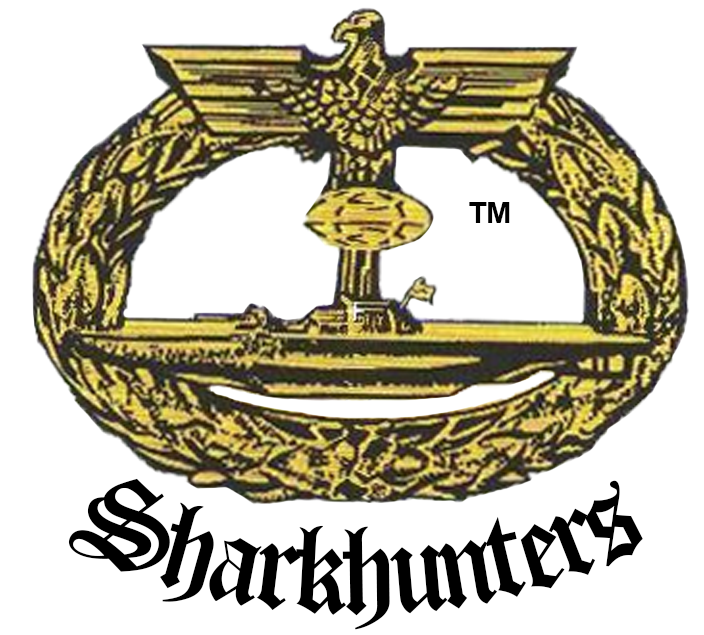 In January 2014, Sharkhunters President HARRY COOPER (1-LIFE-1983) returned to this beautiful country to dig further into the men and activities of the Third Reich during – and after the end of World War Two. Even he was amazed at what he learned. Click on the photo to the left to experience it. 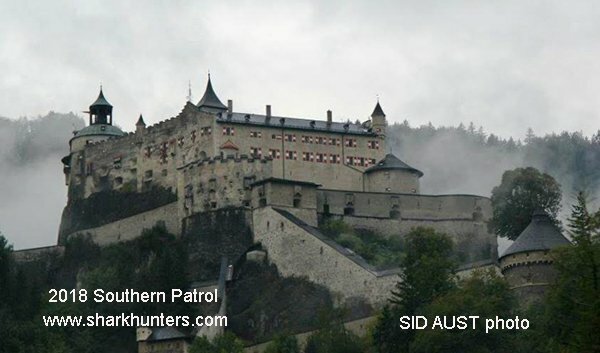 Our Southern Patrol of 2013 begins in München and we tour important historical places in Nürnberg, Kärnten (Austria) and Berchtesgaden. We found new places to explore and again are invited guests with the Ulrichsberg Memorial event. Our group was welcomed by the veterans organizations and by the veterans themselves. New friendships were formed and old friendships renewed – and we found a new home in Bavaria. 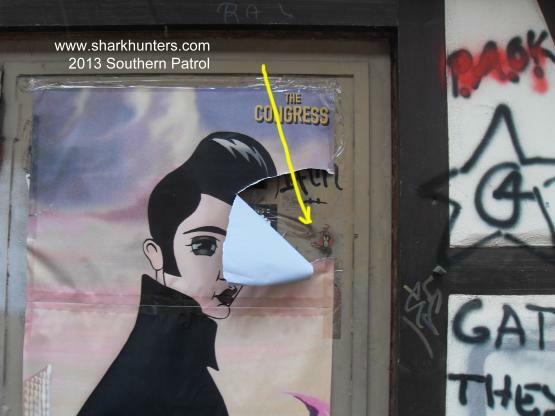 Click on this tattered poster for an Elvis impersonator and learn what this yellow arrow is pointing to. You may be surprised. Click on the Elvis photo to read more of his comments. Visiting a good friend in Northern Germany is a funny way to begin our Southern “Patrol”…….come with us as we transit Germany then into Austria. Click this photo and join us in history. It has been a few years since we were here in Berlin. Much has changed and yet much has remained the same. It may appear that this is a security guard intending to keep us out of some high-security place. Quite the opposite – he is security, but he is one of us and on hand to guide us to …well, just click on the photo and come with us. NOTE – Some of these places have had their use and history so ‘bastardized’ it is highly unlikely we will return. You will understand when you tour the site. Sharkhunters have not been here for several years and it was well worth the wait! Some things changed for the better, some for – well, you understand and some have been removed from consideration from future “Patrols”. Click on this photo and join us. NOTE – Some of the places we visited on this ‘Patrol’ are now gone and are lost to history forever. Sharkhunters return to this beautiful area for more history and visiting with veterans of the war. NOTE – Some of the places we visited on this ‘Patrol’ as well are now gone and are lost to history forever. 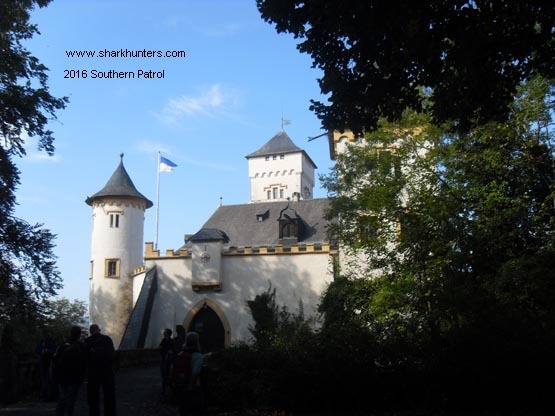 Sharkhunters are again in this historic place where Hitler, Bormann, Göring and other leaders of the Reich had homes……..and we found new tunnels! History and folklore are remembered. Click on this photo and join us for a trip back in the footsteps of time. Strange hotels, old veterans – and more! 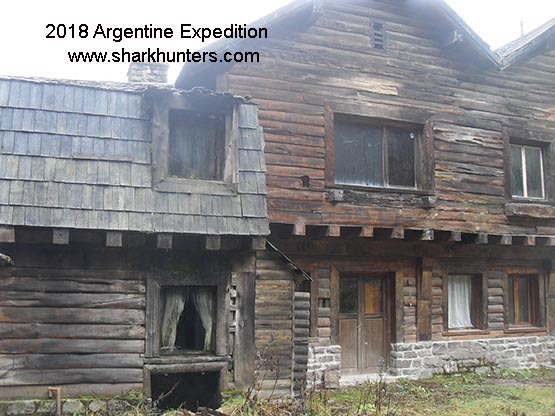 Sharkhunters went to this province to the northwest of Buenos Aires and visited two eerie but historic old hotels that were important to the Third Reich – before, during and after the war including one that was built in 1944 with elevators, air conditioning – and a plastic surgery clinic. This is truly a voyage into the tunnels of time! Click the photo and join us. Sharkhunters are again in this historic place where Hitler, Bormann, Göring and other leaders of the Reich had homes …and we found new tunnels! There is a little-known island in the middle of the South Atlantic, possession of Brazil and where the Brazilian Navy maintains a small contingent to control fishing rights for 200 miles. In 1938, Brazil pulled their people off the island and one week later, a group of German ships arrived – they built radio towers and more. The Germans left in 1941 and Brazil put a small group on the island but in early 1945, the Brazilian Navy again left the island – and again, a contingent of Germans arrived where they maintained flocks of goats, herds of pigs and sea turtles. This food, along with the ample fresh water on the island, replenished the “Black Boats”, tramp steamers, sailing vessels etc. on their way to South America with thousands escaping the fallen Reich. Germany maintained a small staff there until AT LEAST middle 1947! Click on this photo and join our expedition back into the tunnels of time. Adolf Hitler loved the beauty of Bavaria – had a home and a Chancellery there; Bormann, Speer, Göring, Jodl, Keitel also had homes there and when the war was turning against Germany, they had miles and miles of tunnel and bunker systems dug into the mountains just about everywhere. 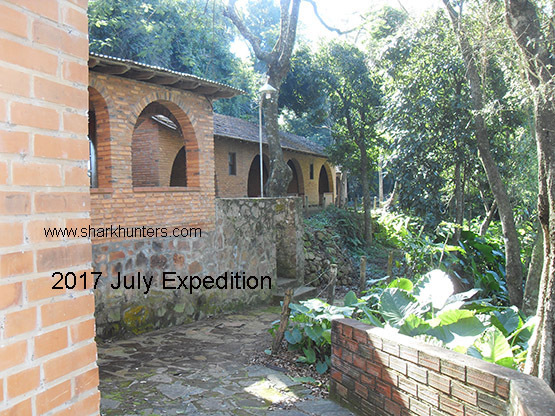 Click on this photo and come with our Sharkhunters “Patrol” to this historic area and visit the abandoned buildings, the tunnel systems, the scenic beauty and come with us into the footsteps of history. Come with us to a simpler time – enjoy old Germanic folkloric songs and dances, meet with old friends and new – enjoy fantastic food in a community setting. It is the way life once was …and should be again. Click the photo. Sharkhunters return to the homeland of the escaping leaders of the Third Reich and find more history. Click this chart of the Argentine Flag and see for yourself. We learned even more on this trip. This is raw history as it is being rewritten – it will astound you. München; Nürnberg; Kärnten; Slovenia; Croatia; Ulrichsberg; Austria; Italy – meeting with so many veterans; at the Memorials – everything just outstanding. 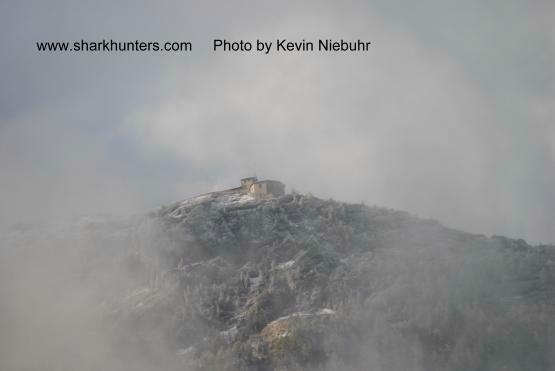 Click on this eerie photo of Kehlsteinhaus (Eagle’s Nest) in a blizzard, and join us on this fascinating tour back into history. Thanks to JEFF CARSON, the “Tunnel King”, we go places most people never hear about. Sharkhunters were in Germany in June to celebrate the Summer Solstice with traditional German songs and folkloric fellowship. Click on this photo of the beginning of the procession and join us. In World War II, the 5th SS Division engaged eight Soviet Divisions here in this tiny little village in Ukraine. Come with us and tour the battlefield, see the house in which General Steiner had his field HQ; meet veterans of the 5th SS and visit with residents. There is much more to be seen in Uspeinka. Click on the photo of the soldiers’ cemetery to the left and join us for this walk back in time. 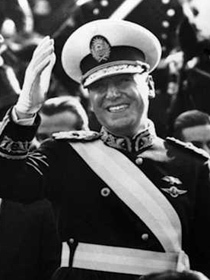 South America’s Love Affair with the Third Reich. If you think that the Third Reich and many of its leaders and high ranking personnel perished in Berlin and elsewhere at the end of the Second World War, you are in for a massive surprise. 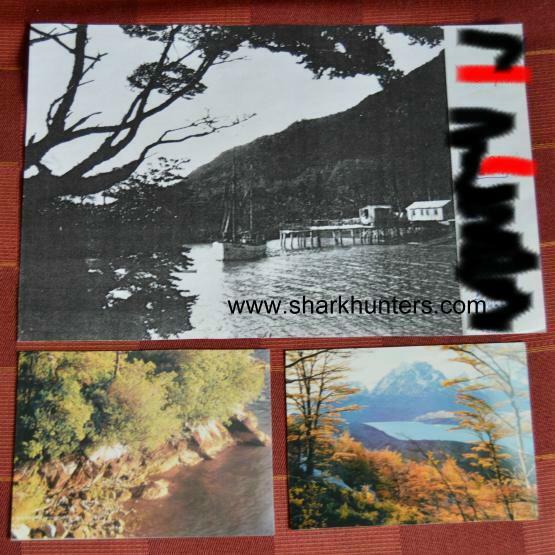 Click this chart of the south Patagonian coast and see for yourself. Another tremendous Sharkhunters Patrol – München; Nürnberg; Austria; Italy at the battlefield where Hauptmann Erwin Rommel won his ‘Blue Max’; the ceremony at Ulrichsberg and much more. Click on the photo of our gathering there with the Austrian Army and join us. We visited inside the house of Josef Goebels; in the former great hall of the Communist Party by the fallen statue of Lenin; to the secret command bunker of Großadmiral Karl Dönitz and INTO HIS HOME; to the palace ‘Sans Soucci’ and Checkpoint Charlie; to Karlshorst where the surrender was signed; to the Reichstag; the site where Claus Schenk von Stauffenberg was shot after his failed assassination attempt at the Wolfsschanze; into bunkers and tunnels beneath Berlin and high atop a massive Flak tower; to the magnificent Stamlager of the Kaiser; the Command Headquarters of the OKW; into a secret command bunker; into Poland and some fortresses and so much more. Click on this photo of a secret command bunker and join us. Click here on one of the last photos we took of Hans-Georg Hess. …and a little bit of Italy as well – ceremonies, veterans, historical places, fellowship, fun – and walking in the footsteps of history. Here Sharkhunters Member Hans-Georg Hess and his wife marvel at a gift presented by a Member. We go deep underground in the command bunker of Großadmiral Dönitz; visit with dozens of veterans; place flowers at the grave of Großadmiral Dönitz; the ‘Fortress of the Four Princes’; a cafe where spies met in WW II and the Cold War; the barracks of the 1st SS (LAH); we each operated an ENIGMA; Poland; ancient fortresses; first Americans EVER into one of the fortresses; ‘Mr. Gorbachev – tear down this wall!’ and we are there! A great many veterans were with us throughout this great ‘Patrol’. Here we see USMC combat veteran and Sharkhunters Member BILL NAPIER with a Knights Cross winning Luftwaffe pilot who flew both Me 109 and Me 110 aircraft. “This is the best tour I have ever been on!” Ed Hargrove, former Steelers linebacker. Click on this photo and join us for this fantastic ‘Patrol’ and read what some had to say about this trip back through the tunnels of time. Once again, many veterans of the U-Bootwaffe joined us for our tour through northern Germany, and we visited some additional places than we did in previous years. This is the entrance to the beautiful but sad and solemn U-Bootehrenmal, the German submarine memorial. Sharkhunters has so far donated some USD $6,500 to this Memorial. Click on the photo of the Memorial and join us on ‘Patrol’. Our Sharkhunters ‘Patrol’ takes us to many historic sites including the fantastic private museum of wealthy publisher Peter Tamm. We met with many veterans AND we had a private meeting with one of the head design engineers from Howaldt-Deutsches Werft and he told us all about the super-secret 214 Class submarine that Germany will be building in the 21st Century. Naturally, we met with many U-Boat veterans. This is a photo of the wreath that Sharkhunters placed at the U-Bootehrenmal (Submarine Memorial). Click on this wreath and join us in North Germany in 2001. This was even better than our 2000 ‘Patrol’ here! Sharkhunters were the special guests at a very special event honoring Konteradmiral ERICH TOPP (118-1985). Click the photo and see for yourself. There is a LOT to see! Once again we toured this magical and beautiful area, and with many Skippers and veterans with us. Once again, we were guests of Dr. Jörg Haider, political leader in Austria. We met with many honored veterans of WW II and participated in the ceremonies. We toured the top-secret submarine base at Kings Bay, toured through a nuclear ballistic missile submarine of the OHIO Class as well as a destroyer. RADM Erich Topp, Skipper of U-552 was with us as was Siegfried Koitschka, Skipper of U-616. Other honored guests included RADM Joseph Peck, destroyer Skipper of WW II; RADM Lev Davidovich Chernavin, the last ComSub of the Soviet Navy; Igor Kurdin, Skipper of a Russian DELTA IV missile submarine and many other distinguished guests. As always, a great many Skippers and veterans joined us, and we went places open only to Sharkhunters and their guests including the fantastic private museum of Peter Tamm. There is too much to describe here – just click on the photo and see for yourself. We toured St. Petersburg, Leningradski Naval Base, the Naval Academy, the Advanced Submarine Training School and we were the Guests of Honor aboard the cruiser SMOLNIY. Then on to the Ukraine where we toured many Palaces, the Black Sea Fleet HQ and we were Guests of Honor at another reception aboard the guided-missile cruiser KERTSCH. We were in the “Valley of Death” from the British Crimean War, then we went on to Moscow where we toured the world’s largest armor museum at Kubinka – and RODE ON A T-34 THAT WAS IN THE BATTLE OF KURSK! We toured the Aviation Museum at Monina. Look closely at this photo – among those who came to greet us, the man in the grey suit is none other than Vladimir Putin! A great many veterans were with us – OTTO KRETSCHMER (122-1985) was our special guest as was ERICH GIMPEL (884-1988), the only German agent put ashore in the USA from a U-Boat who was still living. This was the first time outsiders could visit the former Soviet Union and we were guests of the KGB and the Navy. We toured St. Petersburg, Leningradski Naval Base, the Fortress Kronshtad, the Naval Academy, the War College and countless more places of great interest, never before seen by Westerners. We flew on Fleet Admiral Chernavin’s personal plane to the HQ of the Baltic Sea Fleet where we toured warships and ate in the officer’s mess. Then on to Moscow to visit the Admiralty and the ballet. We visited Hamburg, Kiel, the German Navy Memorial, the U-Boat Memorial and U-995, the Advanced Submarine Training facility and the Naval Base Wilhelmshaven where we toured a warship. We visited cities and towns all over China, toured the Air Force Museum, various naval facilities, on board warships and were the guests of the Commanding Admiral of the East Sea Fleet. A dozen U-Boat veterans were within the Windy City as well as ERICH GIMPEL (884-1988), the only living German agent placed ashore in the USA from a U-Boat. We visited the U-boat bunkers on the French Atlantic coast and toured a French warship. We took the overnight train to Germany and again met with dozens and dozens of veterans and saw great historical sites… then we went to Berlin in East Germany and while we were there, we participated in the Reunification of Germany! We capped this great tour with a visit to Austria where we were Guests of Honor of Dr. Jörg Haider, political leader in Austria and we met Kurt Waldheim. We toured the Navy bases, the Air Force Bases, the Military Academy – we rode a diesel boat, flew an ASW mission on a DC-3 ‘Gooney Bird’ and flew in a Super Frelon chopper. A dozen U-boat veterans participated as we toured Fast Attack boats and more. We tour INSIDE the U-boat bunkers at Brest and Lorient, then we ride the overnight train to Germany. During this time, we meet with more than 200 U-boat veterans, 18 Skippers, and many more… many Knights Cross Holders, two with the Oak Leaf and one with the Crossed Swords! Three Skippers, one Knights Cross Holder, eleven U-boat veterans were with us. 1990 ROATAN (Honduras) – This was a dive trip for Sharkhunters Members. We found ballast piles of Spanish ships sunk by Sir Henry Morgan. 1992 CHICAGO – Many U-boat veterans were with us as we toured U-505 and USS SILVERSIDES. They fired up the diesels on SILVERSIDES for us. 1994 CHICAGO – We bunked aboard USS SILVERSIDES. 1995 GERMANY – We visited with dozens of veterans, toured the Wilhelmshaven Naval Base, the Navy Memorial and U-995, then the U-boat Memorial. 1996 RUSSIA and UKRAINE – We again toured St. Petersburg, Leningradski Naval Base, the Naval Academy, the Advanced Submarine Training School and were hosted again aboard SMOLNY. We toured the palaces Livadia and Vorontsov as well as the Swallow’s Nest, then a gala reception aboard the heavy cruiser KERTSCH. On to Moscow where we again toured the armor museum at Kubinka and the aviation museum at Monina – AND – we had a special tour of the top-secret Krunichev rocket assembly plant where MIR was built and where they build all the space rockets…….we saw them all! 1996 GERMANY – We visited the Navy Memorial, the U-boat Memorial and U-995 which is the only Type VII-C left in the world – and her Skipper was with us the entire time. We visited many places and met with many veterans that only Sharkhunters can accomplish. 1997 KEY LARGO – A return to “Paradise”, and many U-boat Skippers and veterans joined us. 1998 SAN FRANCISCO – Erich Topp, Skipper of U-57, U-552 and U-2513 was Guest of Honor. 1999 San Francisco – Hans-Georg Hess was Guest of Honor. He was Skipper of U-995, and the youngest combat Skipper of any navy in WW II and possibly of all time. 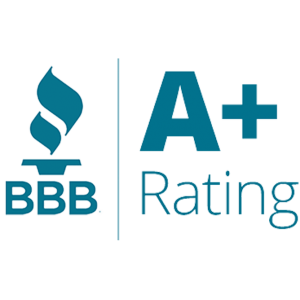 2004… Sorry, the hurricanes torpedoed us!